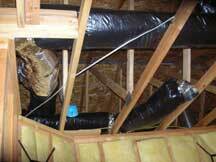 Sept 30, 2007 - Installed the heat recovery ventilator and ducting. 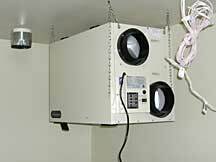 Heat Recovery Ventilator - We installed a FanTech. The unit transfers heat from the outgoing, stale household air to preheat the incoming, fresh air. Using cross-current sections, it ensures the two air streams are kept separate preventing the incoming fresh air from being contaminated by the outgoing stale air.